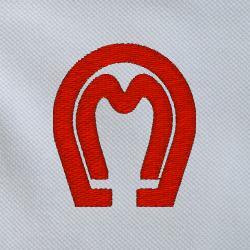 The horseshoe M brand is the trademark of the Mangalarga Marchador that is recognized world-wide. We are proud members and breeders in the ABCCMM, the Brazilian Marchador Association since 2001 when we bought our first Marchador mare. We strongly believe in the ABCCMM inspection process, Brazilian tradition and embrace the Marchador’s Brazilian heritage. All Summerwind Marchadors are registered in both registries – ABCCMM and the USMMA – and thus, eligible for inspection with the ABCCMM. We follow the Brazilian tradition for naming our foals. 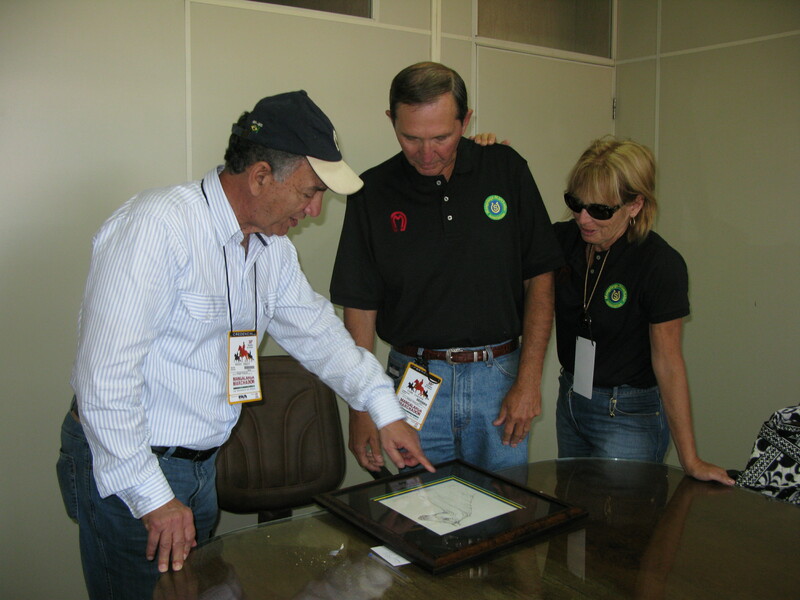 John and Lynn with ABCCMM President Magdi Shaat. In 2012, Lynn became more active in the ABCCMM by becoming an ABCCMM Liaison to the U.S. Now, there is a place for help if you also wish to become an ABCCMM member and register your Marchadors also with Brazil. We know their registry rules, procedures and can offer to assist you in many areas if you too, want to take part in tradition and sharing of knowledge with the creators of the Mangalarga Marchador breed. ABCCMM Membership is required if you want to register your farm name as a breeding farm to name your Marchador foals. The fees are established in Brazilian reals. The annual membership fee is approximately $325 US, but fees will fluctuate, based on the US $ to Brasilian Real exchange rate. ABCCMM Registry Rules (Simplified) Provisional Registration – Livro 1 = Colts Livro 2 = FilliesThe foals must be the product of two inspected and permanently registered ABCCMM horses. Permanent registration is indicated on the ABCCMM registration document as “LIVRO 5” for stallions or “LIVRO 6” for mares. The foal must also be inspected by an ABCCMM inspector and microchipped. Artemis do Summerwind being ridden for inspection by ABCCMM technician Dr. Getulio Vieira. Permanent Registration (granted after inspection) Livro 5 = Stallions Livro 6 = Mares Livro C = Geldings The horse must have provisional registration with the ABCCMM.. 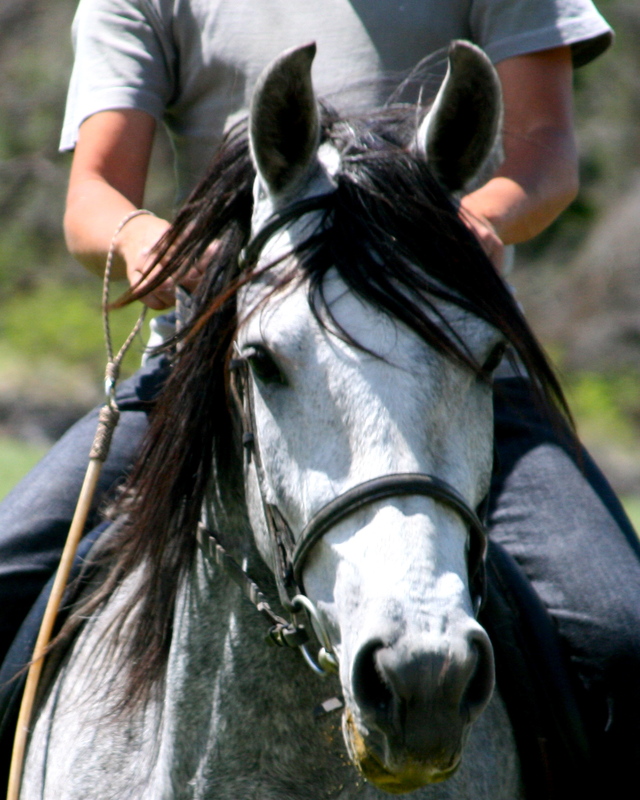 The horse must pass inspection by an ABCCMM authorized inspector at age 3 or older. The inspector will judge the conformation, gait and temperament. For stallions and mares, this means they are entered into the breeding books and their offspring are also eligible for ABCCMM registration (if bred to another ABCCMM registered Marchador).